From the cast and trailer I was hoping that this would be a great film. The acting is certainly great, but the pace, plot and content of the film are enigmatic at best which means the film plods to an unsatisfying conclusion. It is undoubtedly clever, being based on the Man Booker winning novel of the same name by Julian Barnes. But the whole film gets swallowed up in its own angst ridden public schoolboy philosophising about how to interpret historical events and attach any meaning to the outcome. The inclusion of Charlotte Rampling as Veronica invited for me an immediate comparison with 45 Years. This is a film about relationships, about ageing and about how feelings that have lain dormant for decades can be rekindled in a way that embodies the energy of teenage infatuation that accompanies first love, which then unexpectedly finds vibrant expression in later life. 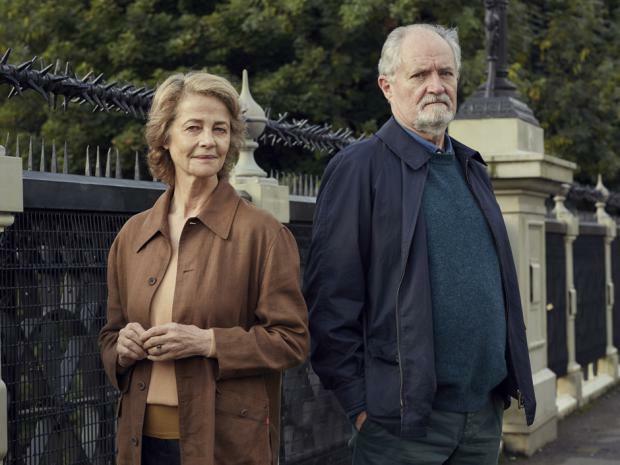 This of course rocks the status quo and the central character of Tony Webster (Jim Broadbent) is most put out to find that others - and particularly his ex-wife Margaret (Harriet Walter) - don't share his enthusiasm to dig up a relationship from 50+ years ago. The turns and twists based on assumptions made in the 1960s at university, prove to be wide of the mark in 2017. Unwanted pregnancies, suicides, pregnant lesbians, the birth of a grandchild and the mysterious and inscrutable Veronica all weave together to produce an unappetising concoction. The adjective curmudgeonly is repeatedly used to describe Tony and it is very accurate - made all the more so by Broadbent's performance. All I can say is, Leicas aside, I'm glad he isn't one of my friends. As was the case in 45 Years, I was distressed by the way in which something seemingly so long forgotten, from so long ago, can be fanned into new and forceful life and destabilise things to such an extent. It causes me to reflect on my past and produce an inventory to ensure that I have nothing similar lurking in the life before the current arrangement! This film is British cinema at its best with a great cast. If you prefer action movies or happy endings I suggest you avoid it as it is true to its title and provides only a sense of an ending. If you want a guide to help you to reflect on your present and past relationships and how they might interact, then this film will invite you to do that. What it can't do is predict the outcome of such interactions and the possible cost attached to them! For me the film was 20-30 minutes too long and at times tedious. The explorations of schoolboy historical epistemology clouded the plot unnecessarily and in Veronica and Tony - both young and old, this film possesses two lead characters that are not attractive - at least to me. It will appeal to viewers of a 'certain age' - Baby Boomers. I'll give it 7/10 - but mainly for the acting.